Nothing is more fun than a little friendly competition. Our sports games selection offers something for everyone. 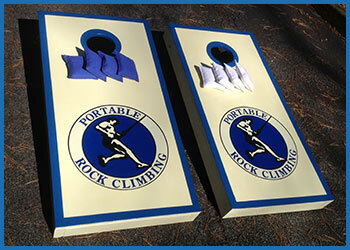 We can customize a package to suit a serious competition or for fun with wacky olympics. This awesome course is 100 feet in length with 17 ninja inspired challenges. This one gets everybody excited to test their skills. The Wrecking Ball is a crowd favorite. Try to knock your opponents off their pedestal with the sturdy foam wrecking ball. Our deluxe unit is an 8 player game, keeping the lines moving with twice the capacity of a standard unit. 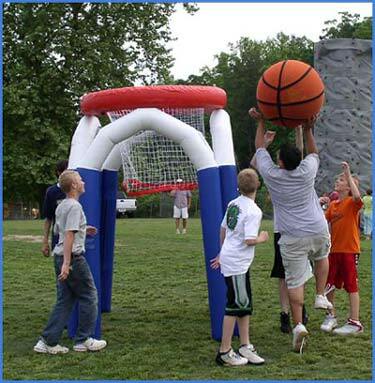 Don't be mistaken, this is a full size basketball shooting game that can entertain multiple players at once. Great for kids and adults. Everybody that sees this massive unit absolutely has to give a try. All ages love seeing if they can make a goal. 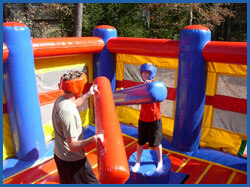 Meltdown is an 8 player action game for the whole family, which challenges your stamina, agility and reactions. Two soft foam spinning arms try to knock you off your podium. You have to duck underneath or jump over the arms. Who will be the last one standing? 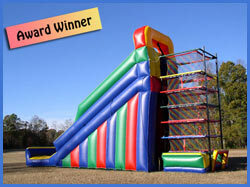 With the Super Slide option attached the climber reaching the top is now rewarded with one of the largest inflatable slides available. 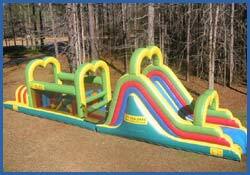 Enjoy the awesome 45 foot long ride down to complete the challenge. 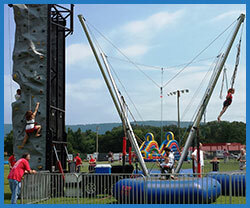 Soar up to 25 feet in the air, perform acrobatic flips and safely experience the thrill of bungee jumping. 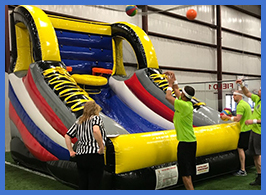 Our 3 Station Trampoline Bungee System is mounted on the trailer of a full size climbing wall which offers the attendees two great challenges in one combo unit. The Spider Zone is a unique piece that allows the climber the unmatched freedom to self determine the entire challenge. You must negotiate 7 different levels to make it to the top. See who the real gladiator is with this crowd favorite. A large 20 x 20 landing area allows for a soft landing in this one on one competition game of balance and skill. 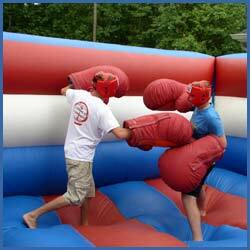 Pull on the super safe, super sized boxing gloves and battle your opponent in the inflatable ring. This unit is always a hilarious crowd pleaser. We offer Soccer, Basketball, and Football all in one great interactive piece. 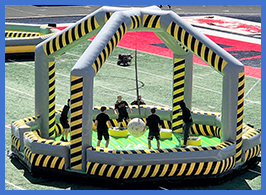 Fully enclosed netting and automatic ball return eliminates the headaches normally associated with lesser quality sports games. 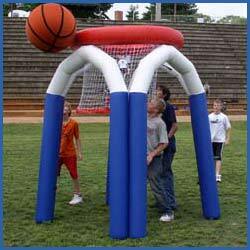 Whether you are just shooting around or having a team game, playing on this huge goal with giant balls that bounce on any surface will definitely get great laughs with a big twist on the classic game. 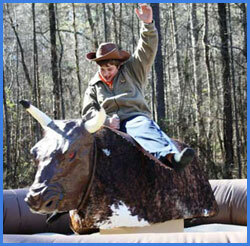 The Mechanical Bull is great for all kinds of events and ours is the latest model with all the upgrades.From young children to the adults, we guarantee this is the one thing everyone at your event will want a turn on. 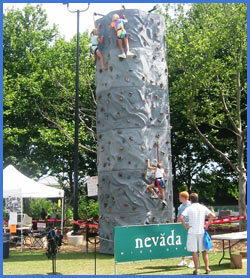 The Rock Climbing wall is always a crowd favorite, with an absolute thrill and challenge for any child or adult, the rock climbing wall is our most popular item. A total of over sixty feet makes this challenging side by side course feel like it just keeps going. 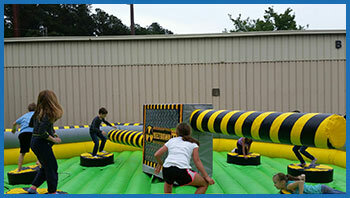 This longer version of the classic obstacle course is always a blast for kids and adults alike. 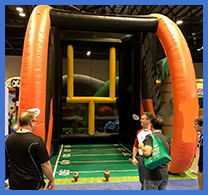 This 360 degree obstacle course has two identical lanes that have the competitors racing over 70 feet of various challenges including a large slide. The racers start and finish on the same side of the course, with all of the action in full view of the spectators this unit creates tons of excitement. 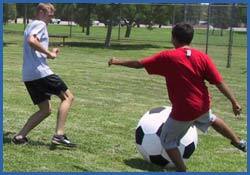 Our giant soccer balls offer a variety of fun games for any age to enjoy. 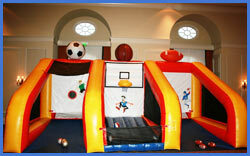 Based on the age group, type of event, and amount of room available, we can customize the game to meet your needs. 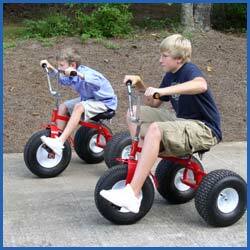 Full size tricycles are hilarious and allow children and adults a chance to see who can peddle their way to the finish line. 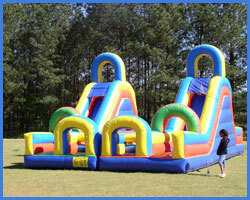 Various games can be incorporated or offer them as a joy ride around the event grounds. 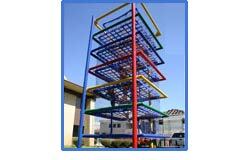 Copyright ©2009 Portable Rock Walls, Inc. All rights reserved.